Little boys like it. I have a poster of military equipment I picked up in a discount bookstore, I’m not sure if it was for kids or not, but now I know how to say things like Apache Attack Helicopter. And if you don’t know how to say something like .50 cal Desert Eagle, you’re lost in CounterStrike. Wow. It’s like the editors found elements of other kids’ drawing and writing books and randomly tossed them together. What’s the relation between the model character and the illustration? Why didn’t anyone tell me that any picture, no matter how simple or complicated, requires just five steps to draw? Hey, First Post! Big fan of your blog, I check it way too compulsively…. Now, I’m no expert, and I just started taking Chinese, but from what I’ve gotten from reading and talking to my Mandarin teacher, in China a job in the military is a respectable career path, as opposed to in the US where it’s generally something people do if they can’t pay for college right off. So, although it seems violent and uneccesary to us (and it still is to some degree, but that’s kind of a different post) it’s not too far off the lines of “Things in the doctor’s office” or “Cars” or something. Haha, even the dog on the tank is holding a gun! I remember myself loved playing with a toy gun when I was young too, and I’m a girl. Mom: What will buy with you hongbao money this year, Baobao? Kid: A 7.62mm gas-operated belt-fed light machine gun. The Chinese Wikipedia entry on 来福枪 says 来福枪是所有有膛线（又称来福线）的步枪的统称 (roughly, “Laifu Qiang is a general name for any firearm with rifling”), but picture is definitely a pump shotgun. A question for better translators than I: 步枪 is defined as “rifle” by Wenlin, which would make the above definition something like “a general name for any rifle with rifling,” which doesn’t make any sense as a rifle by definition must have rifling. Is 步枪 better defined as “firearm” (as I did in the above) then, or am I missing something? There is also a danger that people give themselves English names based on weapons – I once met some dude who called himself “Desert Eagle” – I bet the developers of Counterstrike never thought their handiwork would have that effect. Oh man, that’s just too good. I totally understand why books like this are published in China..
It’s in line with the annual double digit increases in Chinese military spending..the money has to go somewhere right? The PLA already runs hotels, spas/KTVs (aka brothels) and smuggling rings (Lai Chang Xing anyone? ), why not widen the revenue base to include publishing? This material is good for PLA recruitment purposes. I think the US army should get into this as well.. a childhood of colouring and learning about weaponry and viewing military ads on TV and print would do wonders for recruiting numbers! Stephen: “in China a job in the military is a respectable career path”? In Kunming, I saw a shop where you can get your toddler dressed in military fatigues and get their pictures taken. The bombs dropping out of the plane are a nice touch. Used to be a respectable career path. Half the reason the PLA has such horrible corruption problems is because they just can’t pay as well as the civilian sector anymore. Well, the point of teaching kids such things is because presumably, they want to learn about such things. If China is a country of spoiled kids, the spending power of 5-year olds would be presumably higher than it would be in the West, and since not many Chinese are raised to be Western liberals, they might not have any objections to providing their kids with this particular manual. As I teach almost exclusively children, I’ve never seen a shortage of toy guns making the rounds … but even if you put them all together they don’t come close to the synthetic-sound emitting arsenal my buddies and I had as a kid – and I’m from Canada, our army would be hard pressed to fill a canoe, possibly because the Yanks keep killing them in Afghanistan. I think kids just like guns and war and bombs. I remember the first things I drew as a kid were these crazy war scenes. When I was 15 I was out blowing up bottles with my buddy’s .22 and shotgun. As I’m what might be called a pacifist now, all the exposure had little affect. PS: John, I agree – that Peer-See post was hilarious and surreal. so what’s the connection between what’s being explained on the page and then the single character with drawing practice at the bottom? For example, fei1 (fly) on the hand grenade page? why do little Chinese kids need to be learning this stuff?? I can’t really see any of those things being more useful or important than… well… uh, anything. The only useful thing on the list was #5 Means of Transportation. And that’s not even close to as interesting as mysterious dinosaurs or military weaponry! At least not if you’re a kid, that is. i am not sure if everyone think like you before he does everything. might have just been fun for kids.They do like weapon and military things,especially girls.If I were a publisher,who looks only for money, I would do the same thing if the publication could bring me money. dezza: Ummm…. Yes, I am kidding 🙁 Haha, nothing like shaming myself right off the bat. In my defense however, I meant something a little bit above the average rank and file… Still, I was just excited to say something, It happens I guess. Steven: above the PLA rank and file brings you into the underworld of PLA corruption and smuggling…while that may make a soldier rich, I still wouldn’t think the majority of Chinese people would consider that a respectable..unless their definition of “respectable career path” is to become rich through unethical and illegal means? Well dezza, now I know! The PLA is definately a legitimate career path in the interior of the country, and not just for profiteering and smuggling either. If you ever talk to the ordinary soldiers and NCO’s (on trains, etc) they are quite honest about the benefits its provides for people from second tier cities, and also the drawbacks, but on balance it is a stable living with respect, and is a pretty good choice if you are from small town Jiangxi or somewhere. Excellent renderings – these books continue the war-theme throughout society. It’s like kids playing cops and robbers, indians and cowboys… everything is the same as before (human emotions, needs, wants), technology changes(weapons of war, fax machine, Internet, phone, television, etc.). Thanks for sharing, John. Pfffft, if they are trying to teach children, they ought to teach them correctly. Picture 9, the 高射机枪, is certainly not an anti-aircraft machine gun. The ammunition and feeding mechanism clearly indicates that it is a crew served 35mm automatic grenade launcher. Bahumbug I say! 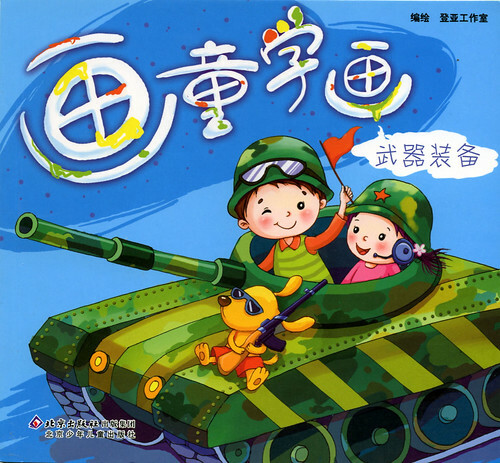 “来福枪（来复枪）”is indeed a translation of “rifle”, at least was. However, it’s seldom used today. The standard translation for “rifle” now is “步枪“. Even when the term “来福枪（来复枪)” appears sometimes, it almost exclusively meant for “shot gun” , but in fact the correct translation for which should be “霰弹枪” . The confusion is likely caused by different translation styles ouside of mainland China . I remember people calling shot gun “来复枪” in those old HongKong movies. I’m not sure how people in Taiwan or HongKong translate it today, but to me “来复枪” is not a accurate translation and is possibly a mistake made by translators who lack millitary knowledges. Hope this will help clear things up. I am curious why the weaponry is American and why the children are not Asian. Guess it’s just a generational thing. Born in ’42 most of my comic book reading in the early 50’s revolved around the Korean War/Police Action (well, actually, I read many more Bugs Bunny/Donald Duck comic books), GI Joe, Blackhawks et al. Also, during this time span, built many Revell model kits of not only fighter aircraft, but tanks, artillery pieces and naval vessels (I don’t count the “Constitution” model I built early teens). Can I get a kids book about drawing suicide bombers and IEDs? On the topic of soldiering being a respected profession, I think that traditionally in China it hasn’t been seen that way at all. One of my favorite quotes that I usually use is found in a Lin Yutang book and it is attributed to Confucius. The saying goes “Good steel does not become nails as good men should not become soldiers.” I tried to find it is Chinese but I couldn’t.